“We are committed to maintaining resilience and building a strong future in a rapidly changing world.” said Mr John T Davies in his address to members at the Annual General Meeting of the Royal Welsh Agricultural Society. 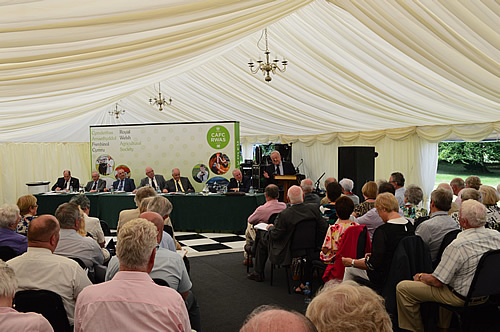 Mr Brian Jones, 2017 President, addresses members at the Royal Welsh Agricultural Society’s Annual General Meeting. Mr Harry Fetherstonhaugh, Honorary Show Director gave an outline of what is in store for the up-coming Royal Welsh Show, which will be opened by a respected Carmarthenshire businessman, David Gravell and Arwel Jones, Chair of Wales YFC. The big attractions in the main ring this year will be the incredible Lorenzo International Horse Display, the exciting and energetic performance from the Kangaroo Kid, the amazing RAF HAWKS Parachute Display Team, Black Mountains Falconry, Tristar Carriage Driving, Merion Owen and the Quack Pack, Inter Hunt Relay, trotting competitions and much more. The 2017 Royal Welsh Show will take place at the showground in Llanelwedd on 24 - 27 July.